Willian on the move this summer? Brazil international Willian is seemingly prepared to leave Chelsea in the summer unless the club are willing to offer him with a four-year contract. The attacker's current deal expires at the end of next season and so far, there has been no progress in terms of committing him to an extension beyond that period. According to Evening Standard, Willian is likely to pursue a fresh challenge away from the west London club in the summer unless they are willing to match his contract demands. The Brazilian is said to want at least a four-year deal with a decent wage hike but that appears far from happening with the club holding the strict policy of offering one-year extensions to players aged above 30. 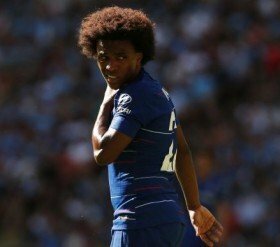 Willian has been the subject of interest from both Paris Saint-Germain and Barcelona of late but he has previously indicated that he is content plying his trade for the Blues.